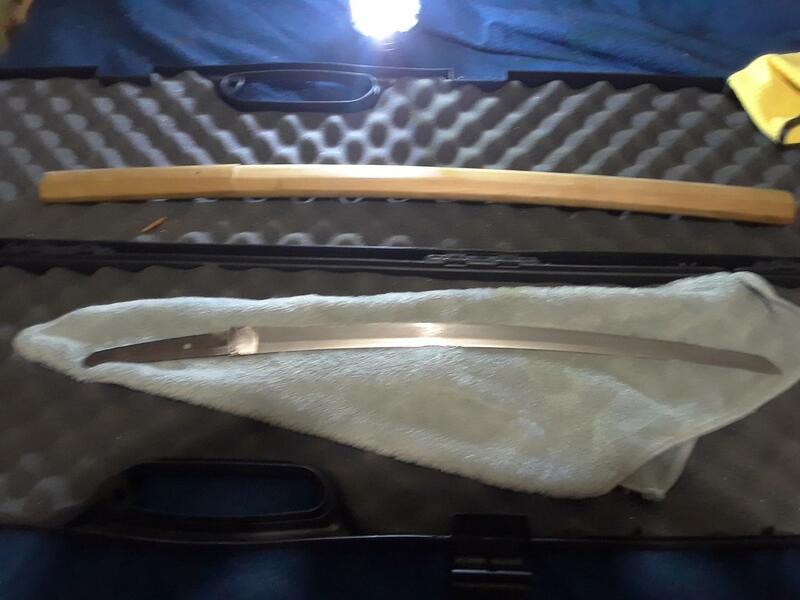 Just joined as I saw that you're all a very active community and as I cannot read signatures so I thought I would ask for help with this particular wakizashi. It has a kikumon on the nakago and then a smith signature. I would love to be told any sort of information you guys can glean from the signature. Age, smith, apparent rarity would all be much appreciated. I've only recently started to acquire more nihonto for my collection of blades and I am now sitting at a little little over half a dozen nihonto of varying types. It has the original silver foil habaki and a shirasaya. If something special, it would be my first nihonto to choose for restoration to display mounts. Pictures below, feel free to ask for more and I can try to get more! Oh, I have others too I might ask help for later if you all don't mind. A few wakizashi and a gunto. I think I might even have a very likely kyu gunto blade (profile matches). Oh, I'll fix that. Thank you. I know the picture of the signature didn't exactly capture properly. Is it intentional defacement or just poor handling leading to corrosion? I gather the suggested smith was around 1650C.E. and the silver habaki suggests this as was his particular style to mount them. What other information exists on this guy? Also, thank you very much for your help! It is much appreciated. Most of my knowledge on swords lay in American style and construction, but since encountering a Japanese gunto, I've fallen in love with them as well! Thanks Bob! So would this be a good candidate for repolishing and mounting? I've no idea on how special/rare this particular smith's blades are considered. I'd appreciate any info on value so I could also decide how much would be intelligent to spend on restoration. This is definitely one I will keep for myself regardless! It just has a certain special feeling to it. I'll definitely post pictures of others I have when I get a chance to work with some better lighting. As this is not my area of specialism, please elucidate me - there are some subtle differences in execution of the kanji, but more importantly: one of the chrysanthemums is chiselled in a clockwise direction and the other in counterclockwise, which I would not expect of the same smith. Different generations or possibly gimei? About having the sword polished and remounted: have you read the paragraph on the subject (I'm new to Japanese swords and I want to get my 1st sword polished and/or have koshirae made for it) in FAQ above? I have not! I shall do that. 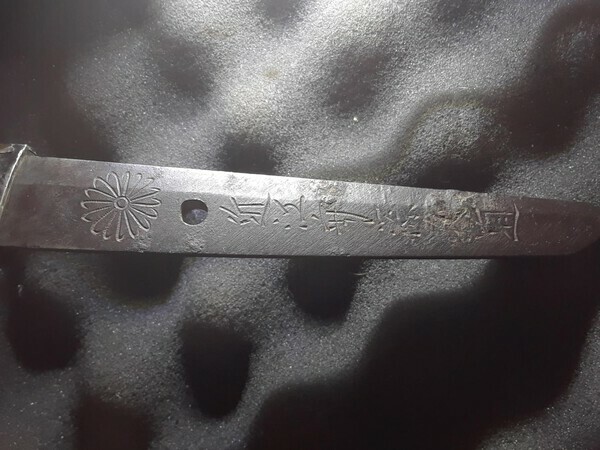 I also believe this blade might be worthy of at least a base polish to remove the light spackling of pitting on the surface and more clearly define the hamon as it is weakly visible on its own with the variation in micro-pitting defining it more clearly. Chris, I'll stick my neck out and say there is NO SUCH THING as a "base polish" for a blade that is considered collectible - there is no purpose or point in doing so. There is something called a "base polish", but is properly called SHITAJI TOGI. This is the first phase of polishing wherein the basic shape of the blade is "set" - that is, pitting, chips, rust, "woofs" from a previous polish etc etc etc are removed and the sugata fine-tuned as necesary. The togishi then thoroughly cleans his togidai (polishing station) for the second phase of polishing called SHIAGE TOGI. This is the "finishing" phase where the hamon and hada are brought out and burnishing of shinogiji and mune are DONE. The point is, when the shitaji togi is finished hardly any features can be seen. It is the shiage togi that brings out the hamon. In short Chris, for a collectible sword the only way to go is a complete polish from start to finish. Anything else is fiddling/tinkering/stuffing around or whatever you want to call it... The most important thing right upfront is determining whether your sword is worthy of the full process. Alright, well then, can anyone possibly help me come to an understanding if this particular wakizashi would be worthy of such treatment? I am fine with it going back into a new shirasaya if it means a proper polish to reveal what it really looks like. However, due to my lack of knowledge on the maker and apparent rarity, I am unable to decide this alone. I can provide more pictures. You'll have to forgive me if I don't know all the terminologies yet. I know Japanese blades are a very niche market and people are very particular on how things are done, so I want to make sure I am respecting the blade and the smith who made it by giving it the proper treatment if it warrants it. The kiku mon looks strange to me. In any case, more pictures of the blade in focus and good light would help. But it really depends on your budget. This sword, regardless of the signature, is run of the mill journeyman work. If you polish it you would surely never recoup that investment, but there’s not necessarily anything wrong with that. In the end it’s up to you. Just make sure you use a legitimate and trained polisher. There are a few smiths who signed with that name. Looks to be 3 generations of smiths all named Hisamichi, plus one or two other smiths of that name who signed in a different manner. There is a book of swordsmiths written by Markus Sesko that you might look into buying. It has details on these smiths. I can't tell which one yours is, or whether it is legitimate or not. Wakizashi tend to be not as valuable as katana-length swords. So I'll echo what Michael said above...you might not recoup your investment if you put $2000 or more into insuring, sending, polishing the sword and possibly making a new shirasaya. See if there are any sword dealers around you, or any sword shows that are coming up. You could show it to someone with a bit more knowledge and get their opinion. Professional evaluation (shinsa) can be done at some US sword shows. Dig around on the web and on this site for more info.